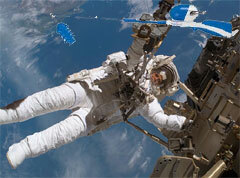 Houston, Texas, June 28, 2009 -- Somali pirates hijacked and have taken control of the International Space Station, NASA sources announced yesterday. The pirates, who approached the vessel using small, inflatable spacerafts, are demanding a ransom "in excess of ten million dollars", according to Dr. Julius Vern, vice-administrator of NASA's International Space Station program, or they will destroy the vessel. 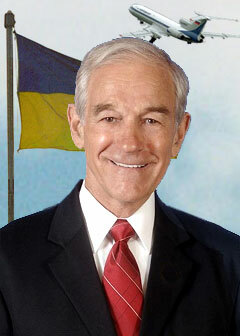 Washington, D.C., March 29, 2009 -- President Ron Paul was deported this morning to his ancestral home of Krakpotka, Ukraine, under the terms of the controversial Ron Paul's No Amnesty, No Welfare for Illegal Aliens Act. Washington, D.C., October 2, 2006 -- The escalating feud between U.S. Secretary of State Condoleezza Rice and NASA (the National Aeronautics and Space Administration) over the proposed use of Space Shuttle Atlantis for diplomatic purposes has tempers in both camps on the verge of explosion, NASA sources said today. Washington, D.C., April 19, 2010 -- NASA, the United States' National Aeronautics and Space Administration, announced today the launch of the first-ever faith-based space program. 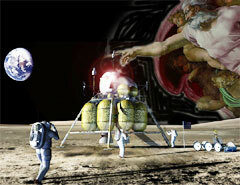 The project, working-titled "In God We Thrust", will develop and launch a range of orbital, lunar, and interplanetary space vehicles using entirely faith-based methods of engineering, aeronautics, electronics and astrophysics. John F. Kennedy Space Center, Florida, October 12, 2006 -- Facing what may be the worst fiscal shortfall in the space agency's history, a spokesman for NASA today announced a plan to resort to the extreme cost-saving measure of acquiring most future spacecraft from budget retailer Wal-Mart. 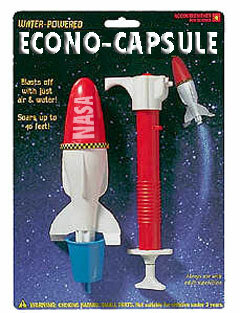 An initial consignment of six "Econo-Capsules" purchased by NASA via the Wal-Mart e-commerce website at a cost of $29.95 each (plus shipping and handling), is slated for delivery this December.